Mix everything but the water together and cut the butter in, then add the water until the dough becomes, well, doughy. 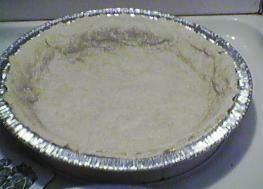 Then put it on a floured surface, pat it down into a round, roll it out to about 1/8 inch, and use a spatula and maybe some folding to help you get it into the pie pan. Then you can decorate the edges, if you want to flute the edges or make grooves. Bake for 8 to 10 minutes at 350º F.